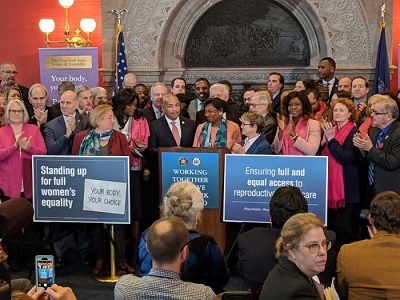 Members of the New York Senate conference celebrate the Reproductive Health Act that legalises abortion up to birth, for any reason, in Albany, New York. (PHOTO: Twitter). Abortion was legalised in New York some three years before the Roe v Wade decision, but remained on the state’s criminal code, making it a felony to perform late-term abortions according to the Democrat & Chronicle. The New York State Catholic Conference said in a statement on Facebook that Democrat New York Gov. Andrew Cuomo was expected to sign the controversial bill at a reception in the Executive Mansion immediately after legislators voted to approve it. And Cuomo appeared ready as he celebrated Sarah Weddington, the lawyer nationally known for successfully arguing the winning side of the Roe v. Wade case before the US Supreme Court. Weddington was recognised in the chamber during the vote. And The Almighty God’s judgement will follow! It’s murder and the blood cries out for righteousness to prevail! John 10:10 – it’s satan that kills. God will have His way!